1 kg potatoes, peeled and cut in about 3cm cubes. Don’t have to be too accurate here, just make sure pieces are not too small. Bring a large pot of water to boil. Add the potatoes and boil for 10 minutes. They will be undercooked but that’s ok. Drain well and put in on a large piece of heavy duty foil. Pinch the edges of the foil to create a rim around the potatoes. Drizzle with the olive oil and add the rest of the ingredients except the lemon juice. Mix gently. 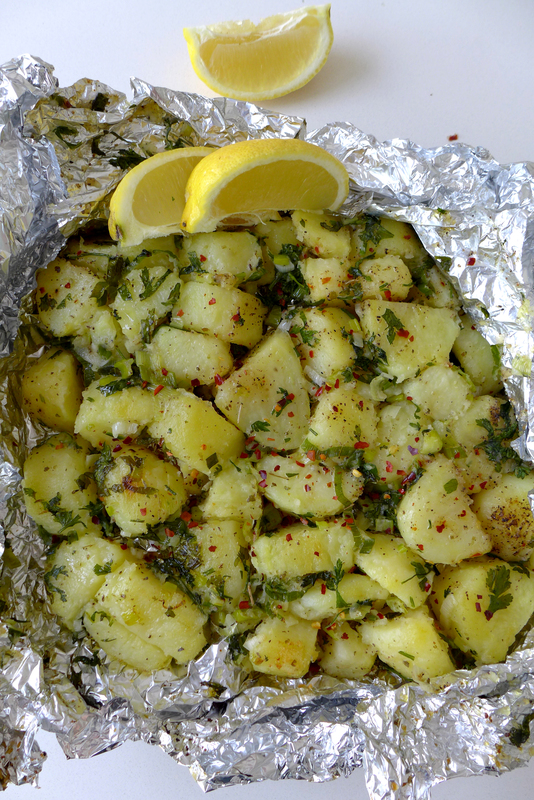 Cover the potatoes with another piece of foil and tuck it under, making sure the potatoes are completely sealed. Grill the «package» over medium heat for 20 minutes, turning it over once. Open the package and serve drizzled with the lemon juice. Note: You can bake the potatoes in the oven if you don’t feel like grilling. Preheat oven to 200 C. Bake the «package» for 30 minutes.